Millions of Americans face housing trouble, from the elderly struggling to make inflated mortgage payments, to renters who can barely afford their lodgings. 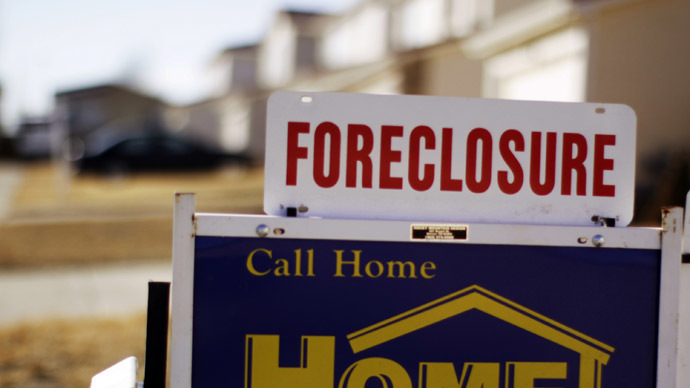 The housing bubble responsible for their woes was caused by bad loans, researchers say. Thirty percent of homeowners 65 and older – some 6.5 million Americans – were still paying a mortgage in 2013, compared to 22 percent in 2011, according to the Consumer Financial Protection Bureau figures quoted by the Associated Press. The median mortgage held by seniors has more than doubled since 2001 as well, from $43,400 to $88,000. The number of Americans 75 and older still paying off home loans rose to 21 percent in 2011 from just 8 percent a decade before, according to Federal Reserve statistics. As home values climbed, many older Americans refinanced their loans, or leveraged their homes as collateral to get cash. When the bubble burst in 2008, many were stuck with mortgages far in excess of their home’s value. A 2012 study by the AARP found that 1.5 million Americans 50 and older lost their homes between 2007 and 2011. Elderly homeowners aren’t the only ones feeling the fallout. A recent report by the National Low Income Housing Coalition, titled “Out of Reach,” found that paying an average $1006 rent for a two-bedroom residence in the US would require the average hourly wage of $19.35, or $40,240 annually. Meanwhile, the estimated average hourly wage of renters in the US was $15.16, while the federal minimum wage was $7.25. The research was based on renters having to spend no more than a third of their incomes on housing. Earlier research found that over 11 million US families paid at least half their income on rent. “There simply isn’t enough reasonably priced, decently maintained housing to meet the demand, and rapidly rising rents outpace wages,” Oregon Governor Kate Brown wrote in the introduction to the report. A new research paper by economists Atif Mian of Princeton University and Amir Sufi of the University of Chicago, published by the National Bureau of Economic Research (NBER), found that during the housing bubble, debt-to-income ratio rose steeply for most households, but more so at the lower end of the credit score distribution curve. “The bottom 40% of the credit score distribution is responsible for 73% of the total amount of delinquent debt in 2007, and 68% of the total in 2008,” Mian and Sufi wrote. They cite this as an indicator that lending constraints were loosened, as mortgage lenders were able to repackage dubious mortgage as securities to be bought up by investors. This drove the housing prices up, while increasing pressure on mortgage lenders to generate more mortgages to feed the securities machine. When the bubble burst, elderly Americans with fixed incomes were left in the cold.